Air travelers have been dealing with more frustration in recent weeks. (CNN) -- Feeling nickel-and-dimed, frisked and scanned, crowded and hustled just to get from point A to point B, air travelers seem to be reaching new levels of frustration and unhappiness. Already on edge after the failed Christmas Day bombing of Northwest Flight 253, they're dealing with ever-changing security measures that the Department of Homeland Security says have been designed to be "unpredictable." Travelers who would rather check their luggage than fight for space in the overhead carry-on bins now have to pay even more if they fly on Delta Air Lines, Continental, United, US Airways or American Airlines, all of which have raised their checked luggage fees since the beginning of the year. Add weather delays, cramped cabins and grumpy personnel to the mix and the misery grows. "It's just ridiculous at this point," said Victoria Tucker, a consultant who lives in Atlanta, Georgia, and who flies every week on business to Sioux Falls, South Dakota. "I do this 52 weeks a year and sometimes you're at wits' end." Tucker dreads booking her flights for the month ahead, she said, because she automatically thinks about the four Mondays she'll have to spend hurrying through airports to get to her destination and the four Thursdays when she'll have to do the same thing as she returns home. Tucker, 32, also dreads the eight trips through security she'll have to make during that month, especially if there are leisure travelers ahead of her in line who may not know the latest rules and slow the process down. "For people who don't travel as much as me, I can't imagine how tricky this can get for them," Tucker said. 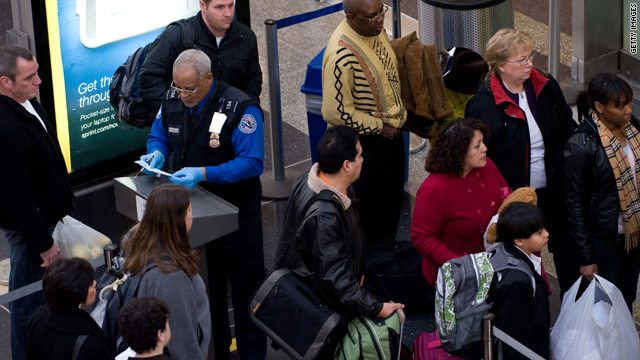 The changing rules at security often cause the most aggravation for experienced travelers. Evan Falchuk, the president of a company in Boston, Massachusetts, who flies on business about once a week, said it's a pain to go through the process. "It's frustrating because it's hard to tell, as a law-abiding citizen who doesn't mean to do anything bad, exactly what's going on and what they're really looking for," Falchuk said. Gary Leff, another frequent flier who lives in Arlington, Virginia, called this part of the security process the "shoe carnival." For him, the vast amounts of time spent waiting are the biggest hassle of flying. "The thing that's most frustrating is that it's unclear what you have to deal with," said Leff, who recently flew back to the United States from the Caribbean and showed up three hours early for his flight for fear that the security lines would be overwhelming. "It takes more time and so you have to leave earlier and earlier to go to the airport. Most of the time you just wind up sitting... but you don't know what the lines are going to be like." Leff said it's not clear that any of the security measures being taken -- including putting people through full-body scanners and producing detailed images in what he jokingly called "nudiscope" -- actually protect travelers. "It's mostly silliness," Leff, 35, said. "If I'm a terrorist, I'm happy, right? Look at what I've caused." The Air Transport Association, which represents the nation's major airlines, countered that the new security measures are designed to enhance passenger safety and are being implemented with the least amount of inconvenience possible. The group also defended the fees being added by the airlines. "These fees are not just about more revenue," wrote Victoria Day, a spokeswoman for the Air Transport Association, in an e-mail. "Most customers tell us that they prefer to choose what services they pay for if it means that they can get the lowest possible fare." But for some travelers, the layers of inconvenience have become just too much. About 27 percent of people who flew round trip at least twice during the past year are more likely now than in the past to skip flying and choose another method of transportation, according to a USA Today/Gallup poll taken earlier this month. The survey also found 76 percent of respondents are dissatisfied with luggage and flight rebooking fees. The irony is that the extra fees aren't working for the airlines, said Joe Brancatelli, who flies dozens of times a year and runs JoeSentMe.com, a Web site for business travelers. "It's hurting their business. They're losing their customers," he said. Still, the airlines reported collecting nearly $740 million in baggage fees in the third quarter of 2009, according to U.S. Bureau of Transportation Statistics. There is a lot of uncertainty for the large airlines going forward, said Betsy Snyder, an airline credit analyst at Standard & Poor's. But she predicted this year will likely be better for them than 2009, although it won't be a profitable one. It's "too soon to tell" how new security measures and fees will impact the industry, she said. The pace of economic recovery and fuel prices also will figure into how well the airlines perform. If Brancatelli is any indication, passenger patience may be running out. He recently decided against buying a ticket from a Spanish airline because he couldn't figure out what he was getting for the price quoted on its Web site and whether he would have to pay additional fees for a seat assignment, advanced boarding and checked luggage. Meanwhile, business travelers have been complaining to him about "insane inconsistency" in airport security. "Right now, we're at a very low period for leisure and business travel, so we're not seeing the full impact. If this is still going on around March or April... it could be chaos," Brancatelli said.